Has found his happy home with his new dad. Mattie has a new home with the most wonderful loving family! She gets walked twice a day (long walks!) and massage/Reiki - life is sweet for this dear loving Basset Hound. 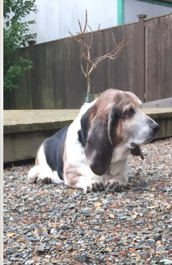 (She is quite old and besides she stole our hearts) but her new family appeared and not only are they kindly loving Basset Lovers but Mattie's "RIDE" is a shiny car fancier kinda old and perfect very Kwuel Mercedes! ​Arthur (Arfur) has been adopted! He has had to live in a car in the past when his owner lost their home and had to resort to living in their car. He was loved but even though Dr. Donna Sowder gave medicines and care for free it ended up that his guardian just was not able to care for him. She entrusted him to our Veterinarian who trusted in us to care for him and find him a loving home. Has found her Happy Home with two wonderful people who love Basset Hounds and have had ones from us before. Leroy & Lacy the bonded brother and sister have found their Happy Home living in the country. They have acres of green grass and will be loved. Has found his Happy Home with a dad who works at home. He is now top dog and will gt all the attention he wants and deserves. ​Today Sweet Pea finished her time with us here at BRoPS. She got to go to her for ever home. She has been through a lot in the past 4 weeks. From leaving the only home she has known to having major surgery to save her life and now a family that is so excited to have her as part of their family the rest of her life. Thank you everyone for your continuing support.